WARNING: This webpage contains the image of the Charlie Hebdo Magazine first cover since terror attack depicts prophet Muhammad, which some may find offensive. France 24, Radio France International RFI Hausa, and Radio Monte Carlo Doualiya (MCD) are wholly owned subsidiaries of the French state's holding company AEF ('L'Audiovisuel Exterieur de la France'). •et; Developing information programmes related to French, francophone, and international actualities. According to France 24's website, France 24 gives a French perspective to international current events through diversity of opinions, debate, and confrontation of viewpoints. The channel provides keys to understanding ever more complex events through in-depth analysis. France 24 also puts culture at the forefront of its programming. RFI Hausa objectives is to provide a French perspective on international and national current affairs and to transmit French culture, values and viewpoints independently, impartially, honestly and pluralistically. France 24 used to be a separate institution but on 13th February 2012, RFI Hausa nd Radio Monte Carlo Doualiya, France 24, and the holding of AEF company merged, shortly before the French Presidental elections. International broadcasters creates value for their users either by broadcasting news from a particular national viewpoint (such CCTV News and RT do) or by aiming at an objective view of world affairs. The latter applies to the independent Western international broadcasters: the BBC, DW and CNN, and to a lesser degree VOA and France 24 and RFI Hausa, which promote a US- and French-centric view of the world, but appear editorially much more independent from French governments than CCTV News and RT. Al Jezeera positions itself as the voice of the Arab world and a balance to the traditional Western point of view. These core editorial values are embedded in the broadcasters' objectives. International broadcasting is a very complex combination of state-sponsored news, information and entertainment directed at a population outside the sponsoring state's boundaries. It has largely meant the use of electronic media by one society to shape the opinion of the people and leaders of another. It involves what was once with pride called propaganda or public diplomacy. Imagine meeting a France RFI Radio broadcaster person who greeted you with a smile and a friendly, "Bonjour". You responded, "Bonjour", before surprising him with a Hausa greeting, "Ina wuni?" meaning ... "How have you passed the day?". You then exchanged a typical series of Hausa greetings asking about each other's work, families and fatigue. "Ikon Allah"... meaning "By the power of God". French Hausa Radio or RFI Hausa for short are amongst the international broadcasters across the African region, the day starts with radio for all groups. It is common for opinion formers to listen to several news programmes in hausa language during the morning to hear different perspectives. Many opinion formers tend to switch from Voice of America (VOA) which airs its news at 6am, to BBC Hausa ('Shirin Safe' at 6.30am, the service's most listened to programme) and then to Radio France International (RFI) at 7am. Amongst the wider audience, the BBC Hausa Service is the overwhelming first choice for international and even national news. This is especially the case in rural communities. Some also listen to VOAhausa and to a lesser extent radio RFI hausa and DW hausa but as well as the BBC Hausa Service they are more likely to listen to the nearest and clearest local FM radio station for local news and information. The BBC Hausa Service is perceived by some to be more relevant than other international broadcasters (such as DW, RFI, VOA). However, in Niger RFI hausa labaran duniya is perceived as relevant because of the country's links with France (rfi afrique hausa). Some opinion formers who listening to Radio France International (RFI), which was recognised as a fairly new entrant to the market and appears to be building a good reputation. There were fewer who listen to Deutsch Welle (DW). The perceived drawback for these broadcasters is that they are not heavily present on the ground. Some listener believed that RFI hausa radio, Aljazeera hausa and DW hausa call experts locally whilst the BBC Hausa Service has correspondents in place on the ground with local knowledge. Radio RFI Hausa or rfi hausa.comm will provide you with a selection of on-demand radio news and music shows, listen to live streaming and articles. You can follow the latest International news, live radio stations, radio shows and music, Breaking News Nigeria Hausa/english alerts, French and African top stories and headlines. This latest international news and/or music app is in Hausa, French, English and 8 other languages such as Cambodian, Chinese, Kiswahili, Spanish, Persian, Portuguese, Russian, Vietnamese. RFI radio hausa has provided an apps to help you download your favorite contents for reading and listening to them offline mode. RFI hausa or BBC hausa explains that, "to flash" someone means to call the recipient's mobile line and allow the phone to ring just once, so that the incoming numer is displayed to the recipient, but the caller hangs up before the recipient answers. This way,the recipient knows the number of the person trying to reach him or her, and hopefully has enough credit to call back. This is possible due to the fact that the caller is not charged if the recipient does not answer. So, do not flash anybody or bbc hausa flash mobile! "Hubba" - a Hausa expression of doubt, or negative inquiry along the lines of "Are you serious?" Why Hausa Language is Broadcast in Special International Hausa Radio channel in United Kingdom UK (BBC World Service), Voice of America (VOA Hausa), Germany (Dutch Welle), China (Hausa Radio), France (RFI Hausa), Libya (radio hausa) and Iran (IRIB hausa Radio)? Access to international radio, television, and video culture has expanded exponentially during the past decades. Several newspapers and many books are written in Hausa and many radio stations (African and International) broacast in Hausa language. Many Hausa people appreciate the daily Hausa language news programs broadcast by the British Broadcasting Corporation (BBC), Voice of America (VOA), Deutche Welle, Radio France Internationale (RFI), China Radio International and Radio Moscow. Many Francophone people listen to RFI almost exclusively. Hausa men of over the age 15 years typically listen to two hours of international radio daily, often getting news from multiple national perspectives (such as British, French, German, Nigerian). Indeed, they are on average far more critically informed from multiple perspectives about leading contemporary global news stories than Americans are. The Hausa-Fulani are nomadic. Which means a person with no settled home, who moves from place to place as a way of obtaining food, finding pasture for livestock, or otherwise making a living. Well, it is easy to say that the only source of information is the International radio service news or foreign services. The international radio channel foreign stations provide services to nomads who do not understand English language. It is because Hausa is one of the major world language, spoken as a mother tongue by more than 30 million people in northern Nigeria and southern parts of Niger. In addition to diaspora communities of traders, Muslim scholars and immigrants in urban areas of West Africa. It is the main lingua franca ("A medium of communication between peoples of different languages") throughout Niger and the northern two-thirds of Nigeria. You see Hausa is widely spoken across West African region even up to Sudan (it's spoken in nine countries total e.g. Nigeria, Niger, Chad, Senegal, Cameroon, Benin, Togo, Ghana and the Blue Nile province of the Sudan.). There's a large Hausa population in Nigeria, and in Niger like more than half the population is Hausa, for example. The Hausa services are not just for Nigeria, they broadcast across African continent. Although there are as many Hausa people in the other countries, because it's spoken in several countries, it makes sense for an international broadcaster to have a service in Hausa which appeals to people in more than one country. Like the BBC Hausa Service, RFI Hausa has many strengths, and appears to be fulfilling its objectives very well. In all three countries covered; Nigeria, Niger and Ghana; RFI hausa is perceived as a credible and reliable source of radio news services that can be trusted. RFI hausa or www.hausa.rfi.fr, is believed clearly to meet its Radio France Internationale objective of building a global understanding of international issues. Credibility and authenticity set the BBC Hausa Service and RFI hausa apart from its competitors and its local presence and excellent use of the Hausa language are other key strengths. The service also plays an important role in influencing opinions about the French people across the region. It has great impact in terms of creating positive associations for the French. There are few differences between the views of listeners and the wider audience in urban and rural areas. However, whilst the BBC Hausa Service and RFI hausa is widely used and respected by listeners; it tends to be one of many sources of information used to build a complete picture. Consequently, they are less reliant on the service than rural audiences in particular for whom services in French or other languages are not accessible. In the future rfi hausa should come up with many more programmes that will educate the Hausa people more. The Hausa people believe so much in the radio news or information that the RFI hausa give. RFI hausa has done so many great things in the lives of the Hausa people. It's educative and gives vital information to the people, especially educating the Hausa people. RFI radio hausa has serious influence on the lives of ordinary Hausa people. RFI Hausa Service has been a very helpful medium so far. RFI Hausa now has a live online radio which give a full-time news format station very popular through Nigeria. As you know RFI Hausa has been broadcasting on air and online from Lagos, Nigeria. There is also rfi hausa facebook and twitter online, including rfi hausa blog and faransahausa. RFI Hausa radio wants listeners more interaction would be valued by the audience, especially the younger listeners. There appears to be a real appetite by young listeners to get more involved with the programmes. The evidence of this can me see online in the RFI Hausa Facebook and twitter fan pages. RFI Hausa have embrace and make use of technology advancements are very impressive. Look at the idea of posting opinion and twitting messages for example. Hopefully, we would like to see them embrace any new development to the advantage of the audience and also encourage the audience to participate in the news making themselves because people are the news makers and participation is very good. Duniya mai halin d'an mangoro... meaning Life can surprise you if you don't take care. You will be moved and fascinated by the close relationships that you will forged with people so different from yourself through your ability to speak Hausa. Many Hausa people will regard you, in a sense, as one of them - that your absence is felt when you don't show up as an abokin hira ("conversation partner"). In Hausaland there exists a communal bonding that you will have not experienced in other places... This bonding is based not on shared class or education or religion. Its core is rather a constant and unqualified embrace of the human condition, actualized through the repeated miracle of "seeing and being seen", and undergirded by an abiding belief in the dignity of life. You have earned your friendships in Hausaland... on ... the basis of... mastery of the Hausa language. Making Sense of the World... Rashin sani ya hi dare duhu ... meaning "Ignorance is darker than the night". any right to report Charlie Hebdo story? Radio France International RFI Hausa or France RFI Hausa com report on the front cover of the French satirical magazine Charlie Hebdo on Wednesday 14th January 2015 edition, the first since attack on its Paris offices on Wednesday 7th January that gunned down 12 people dead, over such cartoons of the prophet Muhammad. Charlie Hebdo's surviving columnist says cover is a call to forgive the terrorists who murdered their colleagues. 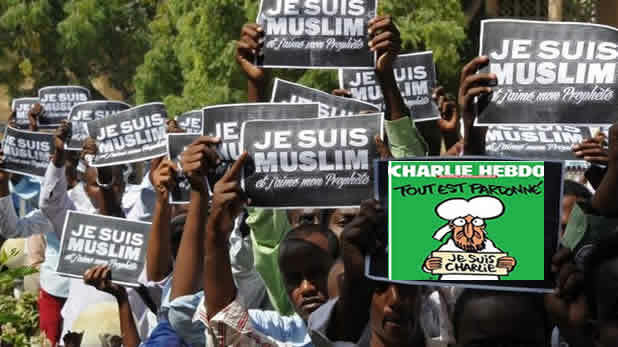 The cover shows an image of the prophet Muhammad crying and holding up a sign reading "Je suis Charlie" (I am Charlie) in sympathy with the dead journalists. The headline says "All is forgiven". Charlie Hebdo cartoonist, explains that the magazine's latest front page was a call to forgive the terrorists who murdered their colleagues. That they did not feel hate towards Cherif and Said Kouachi despite their deadly attack on the magazine, and urged Muslims to accept humour. Thats they are above all cartoonists who like to draw little characters just like when we were kids, and by the way, the people, the terrorists, they once were children, they did drawings too, like us, like every child. So at some point they lost their sense of humour, they lost their child soul which allows people to see the world from a distiance because that's what Charlie is about, to look at the world with a bit of distance. The front cover image has angered many Muslims as depictions of Mohammed are widely considered forbidden in Islam. "Allahu Akbar" (God is Great, from the Arabic)"
"Deserved to be killed because they insulted our prophet many times"
"Expel the French ambassador. Victory to the Prophet of God!" "Have nothing to do with the freedom of creativity or thought"
"I am Muslim and I love my Prophet"
"Insulting the prophet is global terrorism"
"Kouachi martyrs" or "I am Kouachi"
"May God punish this newspaper and those who back it"
"Serve extremists who are in search of excuses for killing and terrorism." "Some holding pictures of the Kouachis"
"Support for the Islamist Kouachi brothers who carried out the Charlie Hebdo massacre"
"The French government should apologise and the French government must stop insults to religious figures." "These disgraceful actions are in the interest of nobody and will only fuel hatred and anger"
"To hell with you Charlie"
"We are all against insults made against our prophet but it is not a reason to kill." "Will create fertile ground for the spread of hatred and terrorism"
Muslim governments also joined the chorus of condemnation of the cartoon. After all the American events of 9/11 have cast a shadow of suspicion on Muslims in Western Europe and fostered a public discourse of arbitrary associations with violence and resistance to social and cultural integration. A record three million copies of Charlie Hebdo magazine are to be printed, in 16 languages, after the massacre triggered a worldwide debate on free speech and brought more than four million people on to the streets of France in a unity march on Sunday 11th January 2015. After all, peace is the most important value in Islam... "Amin". 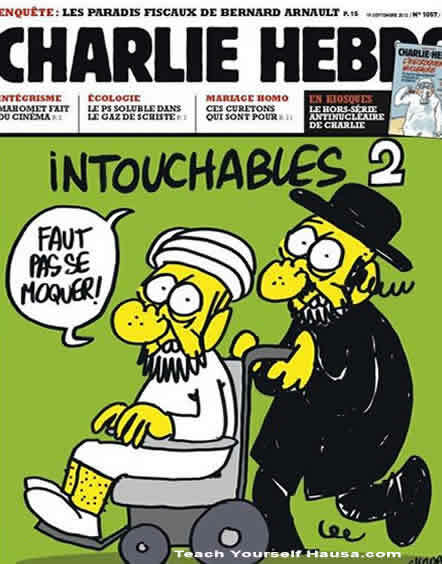 19 September 2012 issue: An Orthodox Jew pushes an old Muslim in a wheelchair, both shouting "You mustn't make fun!" French President Francois Hollande said...Charlie Hebdo's "heroes" had defended freedom of speech and this was an attack on the entire french republic (not rfi afrique hausa).